In the WSJ article on the Apple iPhone antenna Ian Sherr mentions problems with dropped calls. I often here about dropped calls when I’m talking to Americans about cellular technology, but I hardly ever here this from Europeans. There are good reasons for this. Before discussing the iPhone antenna I think it’s useful to explain the differences between cellular networks across the world. Suppose you work for a fast-food chain selling hamburgers or pizzas, you are a manager and you have to decide where to locate your next restaurant. You could put it in a small rural town. In that case there would only be a few other restaurants competing with it. The land to put the restaurant on would be cheap. But, on the other hand, there wouldn’t be many customers. Alternatively, you could put it in a big city. In that city there would be lots of competing restaurants and the rent would be high. But there would be lots of potential customers, if you could out-compete the other fast food restaurants then the potential for profit is very high. In both cases the restaurant itself would be quite similar, though you many need a few more seats, staff, friers and parking spaces if the restaurant were in the big city. Cellphone network companies are in a similar situation. A cellular network in a sparsely populated area may have little or no competition. It’s relatively cheap to buy the land to put the cell towers on, but the number of potential customers is low. In a big city there is lots of competition and the land is expensive. However, the number of potential customers is very high. This is the logic that drives much of the cellular network business. When cellphone networks first became practical they were applied first in the most densely populated cities in the richest countries. This was purely for the economic reasons I mention. The big cities allowed early cell networks to cover a large customer-base with few masts. Then, in time the cellular networks spread into more sparsely populated places and poorer places. These forces led to two distinct technical issue “coverage” and “capacity”. What concerned the network in big cities was capacity. They had lots of customers and lots of data to move. They had to make sure that the networks could absorb more customers without bandwidth limitations being reached. The people dealing with more sparsely populated areas had other concerns, they wanted to build a network to cover as wide an area as possible as cheaply as possible. They needed longer range base-stations and cheaper ones. So, we could draw a capacity/coverage map of the world, and it would approximately follow population density. For example, in places like central Tokyo capacity is the concern, in the American countryside coverage is the concern. Lots of places fall somewhere in-between. These problem have driven many specific technical solutions. For example, there are base-station antennas that are specially designed to deal with the situation where the network must cover a long road, but need not cover the adjoining countryside. A special type of small cell, the microcell, has been created to deal with areas where capacity is important. Many features of WCDMA are targeted at providing high capacity. Whole countries can be looked at in a similar way, and this is where history comes in. In some countries the population is centred on large densely populated cities. In Japan, Korea, China and Spain it’s quite normal for people to live in apartments buildings in large cities. In some of these places the local culture and the law encourages this. In Britain there are strict planning regulations and taxes on transport fuel to prevent the growth of suburbs. In the US and Canada, for example, the culture is different people generally prefer to live in suburbs and the planning laws are set up to encourage use of the car rather than discourage it. This leads to different problems for network operators. In the US and Canada there are large areas of moderately populated surburbia, with some areas of high population and large areas of low population. European and Asian countries have areas of low population too, but the cities and suburbs are more highly populated. In order to tackle the capacity problem in the densely populated Spanish city the network planners have used a large number of small cells. In the American suburb the planners have used a few large cells to serve their more spread-out customer base. In the diagram of the US case the cell tower is in the centre. It has four antennas on and four sets of base-station electronics producing four cells which I’ve marked in red, yellow, green and blue. This has a strong effect on the cellphone market. In the US case a handset at the far side of the red cell is a long way from the base-station. So, the signal from the base-station is weak, and the signal received by the base-station from the handset is weak. If the receiver, transmitter or antenna on the handset is poor then it will drop calls on the edges of the cells. This isn’t the case in the Spanish city situation. There the cells are very close together and a cellphone would always be close to one of them. So, the quality of the RF electronics on the handset is less critical. Indirectly, coverage problems make the performance of the RF electronics (the antenna, low-noise amplifier, power amplifier, etc) more important. This is why Americans so often complain about dropped calls and bad coverage. Cellular network operators worry about this because customers often blame the network for dropped calls. So, one way or another they encourage customers to use handsets with good RF electronics and encourage manufacturers to make them. A common method used by US carriers is to offer “good” handsets in their stores and to subsidise buying those phones with a contract. 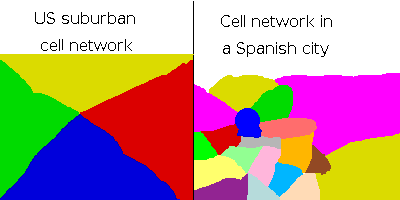 European cellular networks look at things differently, they don’t have to worry so much about coverage and dropped calls. The cellular networks in more densely populated places also offer special subsidies to the handset manufacturers but they’re often for different purposes. In that case the cellphone maker is encouraged to make a phone where the user has easy access to features that earn the network operator high profits. All network operators are “open to negotiation” on this point. If they think a new feature or a new phone will generate high revenue per user then they may be willing to sacrifice RF performance and put up with a few more people complaining about their network. This entry was posted on June 15th, 2010 and is filed under Cellular Networks. You can follow any responses to this entry through the RSS 2.0 feed. Both comments and pings are currently closed. Really nice and detailed view about AT&T (and other US carrier) network coverage and common problem. I hope that exclusive contract between AT&T and Apple as a results have more then revenue for both companies: much more peoples blame AT&T to rebuild network (or invest some money to) and on the other side speed-up whole cellular industry to extend networks.